Take control, get your home seen in all the right places, and take the stress away by sellling your home with Capsel Homes for just £999. Alternatively, why not let us do it all for you. Our full estate agency service takes the stress out of selling your home. We offer fair, transparent prices and our friendly team are there to help you at every step. And no sale = no fee. 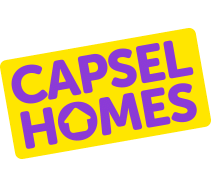 Sign up with Capsel Homes and your property will be listed on Rightmove – the largest property portal in the UK. Once you have uploaded your property it will be listed on the dedicated buyers page, as well as feature in all relevant searches. We’ll show off your property on social media sites including Facebook and Instagram. We take care of everything from showing interested buyers around your home and providing all the information a buyer might need to assessing potential buyers. Not only will we get the best offer for your property but our property experts will manage the sale for you right up until completion. First impressions count! To attract potential buyers and show off your home our experience team will take high quality photos as well as provide a detailed floor plan and Energy Performance Certificate. Our friendly team can provide support and advice and answer any questions you may have along the way. *Total cost is a fixed price and includes VAT. We will contact you to arrange to visit the property within three days of receiving your application. When we visit we will check the information you have provided and provide you with a valuation of your property. We will a need to check that you are the owner and have the right to sell the property. If you are with another estate agents we would advise you to check the type of contract you have as your agent may charge duel or multi agency fees. We will provide you with advice and support during your application and are here to help you sell your property. You have the right to cancel with us up to 14 days following your registration, just contact us for a full refund. Terms and conditions apply. What colour are you? We know that every home is different, which is why we let you pick the colour of your For Sale Board. If you have questions about selling your home online, our friendly team is always on hand and happy to help.